Since its arrival the BBC has been buzzing with activity, not only with the chirpy sound of games downloaded via the amazing UPURS cable, but also for more productive tasks, like writing out articles for this blog. Thus far two articles for BMV have been written from the BBC, all thanks to the installed WordWise rom. I would love to give you a breakdown of the whole program, but that simply is beyond the scope of my understanding of WordWise at the moment. I’ve not been using it long enough to be classed as an expert. I think I fall under the category of “crazy button pusher”. What I would like to do instead, is demonstrate how old computers can still be useful for modern tasks. If your looking to avoid the distractions of Facebook and flash games and become more productive, a BBC Micro might be for you. When the model B arrived at my door, I didn’t have a clue how to work it, which was one of the primary things that appealed to me, working from a clean slate with no previous knowledge. Thanks to the generosity of a fellow Amibay member the BBC, Monitor and floppy drive where given to me for the cost of postage and a few beers. I can not thank the person in question enough, nor should Amibay be overlooked. This is an excellent forum, full of like minded computer users, geeks and collectors alike. The artificially high prices of vintage computers on Ebay, makes collecting a mind field for anyone on a budget. Inside the box the Beeb and monitor had arrived in, I found a copy of WordWise Plus with rom and manuals, as well as some floppy disks. Also amongst all of this was a copy of “The Complete BBC Computer Handbook”. For the first few days of having the computer, this book was like a bible to me. It did not cover disk use in depth, but it did skim the subject enough, that I was able to access the disk drive and boot up the Watford Utility disk which came with the Watford 40/80 drive. Not having any of the original manuals for the BBC, certainly handicapped starting out, however using this book certainly got me off the ground. After a while I turned to the internet and found a forum dedicated to Acorn computers, which really helped bring things together. I highly recommend anyone with an interest in Acorn and the legacy of this British built computer to visit “www.stardot.org.uk”. This forum is filled with some of the most helpful people I’ve had the pleasure to meet online. After registering and introducing myself, I asked a few questions and was offered a wealth of information and tips, which really helped me master some of the more tricky parts of using my Beeb. Again most of the questions I put forward would likely have been covered in the DFS or BBC Micro manual, both of which I didn’t possess. It was through this forum I was able to get my own copies, store them on my Kindle and stuck my head in them. After reading the manual to my model B, I was a little disappointed that disc usage wasn’t covered extensively. At the time the Model B was on sale, a lot of software came on casette tape. Which the manual covers pretty well but for some reason only skims floppies. Did Acorn not think it would catch on? What ever the reason, it was certainly a stumbling block. After working out the floppy drive, the next step was getting the micro up and running with WordWise, which meant opening up the computer. In the next weeks blog I will be covering installing a rom, using WordWise plus and why a cable and a rom chip saved my bacon. In my last article, I covered how the Gameboys one let down was its low resolution screen. After 20+ years of service these screens are beginning to show their age as one by one, they begin to fail. If your Gameboy is one of them, the chances are it is afflicted with pesky lines running vertically up the screen. For many this means the end of their Gameboy. My own original Gameboy suffers with lines running horizontally across the screen, which is less common and not as easy to repair. Yes you heard me right, dodgy Gameboy screens can be repaired with a little know how and in some cases you don’t even need to use a soldering iron. Opening your Gameboy for the first time might seem daunting to some. Even to those of us that are used to repairing gadgets, the process is just as worrying. Luckily there is a wealth of information online, documenting the insides of the classic Gameboy. In fact a quick look on Youtube will bring up a dozen or more tutorials on how to repair the very screen issues being covered in this blog. 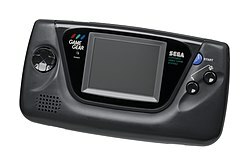 It was through watching several of these, that I began to see where the old Gameboy was failing and how best to fix it. I was intending to make a video showing how to fix the screen. But with the amount of videos already covering the subject, I decided it would be easier if I just include what I believe to be the creme de la creme for you to follow. All that hard work searching done for you, aren’t I nice! This video is excellent at explaining the problems behind the screen and worth watching if you with to learn about the Gameboy’s LCD screen. The following video guide requires you to own a soldering iron and apply it to components inside your Gameboy. Proceed at your own risk! USE THE GREY MATTER!!! USE COMMON SENSE! Now this is where things become a little sketchy and sadly disheartening. My classic Gameboy suffers not with the typical vertical lines, but horizontal ones. So how to fix them? It would seem the general consensus is not to bother even trying. The two ribbon cables connecting the LCD screen to the main PCB can not be disconnected. As such the aging solder begins to dry and crack. Unlike the bottom ribbon cable which deals with the vertical lines. The cable that deals with the horizontal is sandwiched behind the LCD and the PCB. Making any attempt with a soldering iron very hazardous. Your more likely to melt the cable then you are to mend the fault. Even so, I still attempted a repair. Instead of using a soldering iron, i opted to use a hot air gun. The sort you would use for removing paint. I used this method of heating and softening solder on a PS3, to fix the “Yellow Light of Death”. So finding people where suggesting it online as a possible fix, did not come as a surprise. 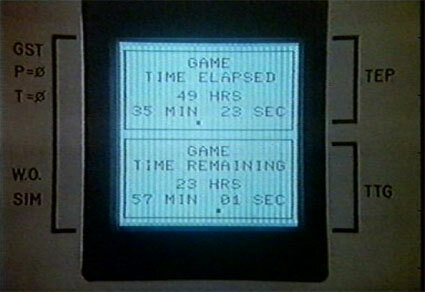 With the Gameboy apart, and the screen laying on a non flammable surface. I set my heat gun to the lowest setting and hovered it above the screen until it turned black. Usual you can see the effect the heat is having on the solder as it begins to soften. Sadly it did not fix the issue of the horizontal lines. Which leads me the think my screen is properly dying. Hopefully in the next few months I will be able to grab another. As I much prefer my classic Gameboy to the GB Colour or pocket. Well I hope thats helped some of you, please drop me a post if you’d like me to cover anything in a future blog. While you might be forgiven for thinking the blogger of ByteMyVDU has nicked the complimentary soap and done a runner, the truth is, I’ve been burning the midnight oil and tinkering with old technology or as my family calls it “tat”. 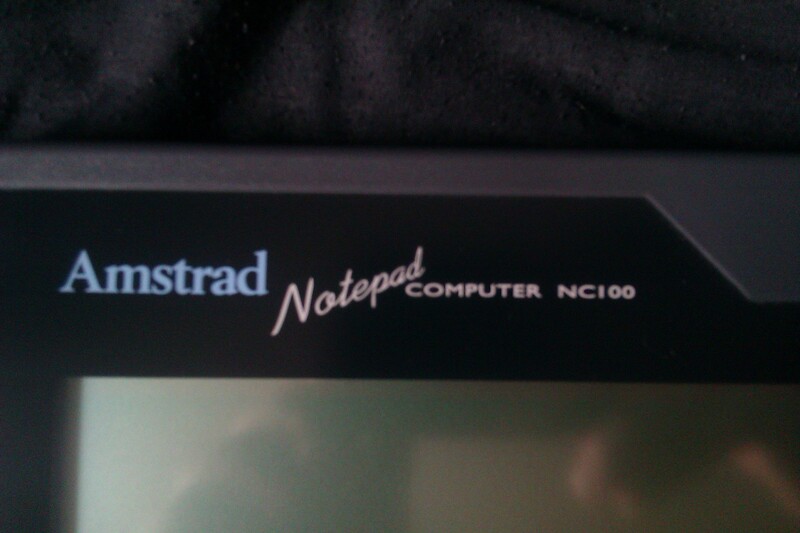 First on the agenda was the Amstrad NC100. It proved to be less a headache then I had expected, which resulted in last weeks blog being written on the 90’s notepad computer. In a later blog, I intend to do a more thorough break down of the system, as I only skimmed the surface, neglecting to cover the most important subject “file transfers”. How does one get files from the NC100 to, say, a home computer running Windows 7 or Vista? All shall be revealed. In the mean time, I’d like the cover my recent adventures in to the 8Bit world of the BBC micro computer. “Retrogamer #101” did a section on this iconic computer which was pretty ironic, given how I’ve been playing around with said machine in only the past few weeks. Speaking as a Spectrum and C64 user, I always saw the Beeb as a school computer. 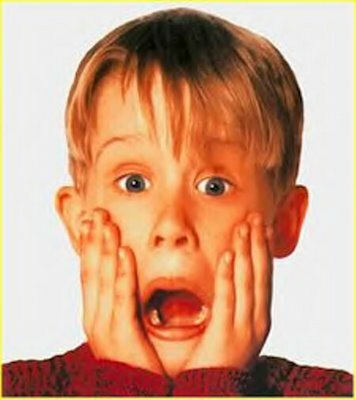 If you owned one at home, that was just SAD! But how wrong I would have been. Okay, the Speccy and C64 held the gaming crown. A quick look over the library of BBC games will reveal no “Batman – Caped Crusader”, “Chase HQ” or “Jack The Nipper”. It is the BBC however, whom we have to thank for “Elite” which gave birth to a whole new game genre. This blog however isn’t to bash the poor Beeb for not being a gaming system, but to highlight it’s strengths. For productivity, the BBC holds it’s own and shines through as a big boys computer, making the other micros seem almost toy-like. Now, I grew up with a C64, my best friend had the Plus 2 Spectrum and then later the Amiga 500+. We were spoiled for choice. While I was at school I didn’t start using a computer for home work until owning the Amiga. The thought of using my C64 for anything else then games, never entered my mind. It was probably because it wasn’t a feature those machines where promoted for. I have since used a Spectrum +2 with a printer, both an dot matrix and LS-120. Saving and loading from tape was a laborious activity and not something I enjoyed, even as a test back in 2007 to see if it could be done. So as a kid back in the late 80’s, early 90’s, I think it’s safe to say, I’d not have bothered 😛 I was a gamer, not an uber nerd like the kid from Wargames! In my next issue, I’ll cover more on the BBC micro and what I’m doing with “Wordwise-Plus” and why I’m getting excited over a serial cable! As a teenager at school I enjoyed writing fiction, most of the time, I wrote down stories the old fashioned way, with paper and pencil. However as I got older my writing gradually progressed. To the point one rainy holiday to Bridlington, trapped in a caravan. I wrote a 25 page science fiction story. Selotaping sheets of A4 paper in to my exercise book, the wad looked pretty impressive. I still remember marvelling at how much I had written. On returning to school, i recall my support teacher was less then thrilled at having to read my drivel. 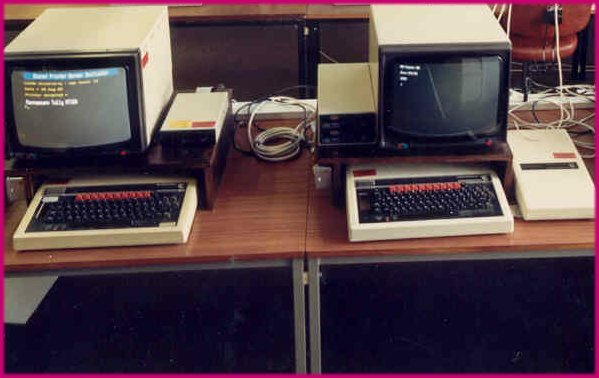 The following year, our school bought several new Amstrad NC100’s. This being 1992-93, the NC100 was pretty fancy kit. So as to avoid being subjected to more stuck together A4. My support teacher, Mr Read. Arranged that i be lent a NC100 over the holidays. At the time my spelling and grammar was rather bad. It was thought encouraging me to write would help me get better. What did i care? I was being given exercise books and being told to write as much as i liked. And now they where giving me a portable computer with a z80 CPU, RESULT! Who said terrible spelling doesn’t have it’s plus side! For six weeks i was able to play with the NC100 and i loved it. It was portable, easy to type on and best of all didn’t take up and room. Laptops at the time where pretty pricey and heavy. Luggable machines like the Sharp PC7200 in my collection, where still in use. Schools where filled with Acorns and BBC Micros. For it’s day, the compact size of the NC100 made it a very attractive looking portable computer. 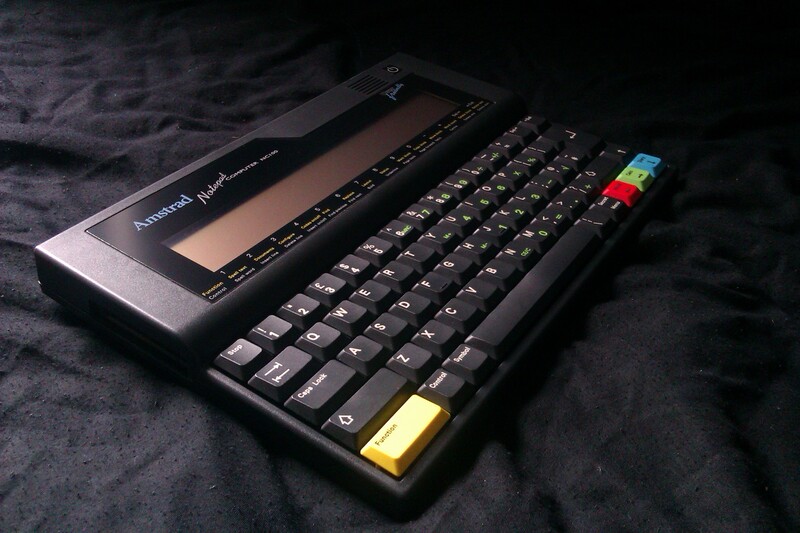 I’ve had the Amstrad for just under a day and already been able to crack on with a blog entry. Due to the simplicity of the interface. Other featured such as text formatting and the spell checker might require you do some reading of the manual. 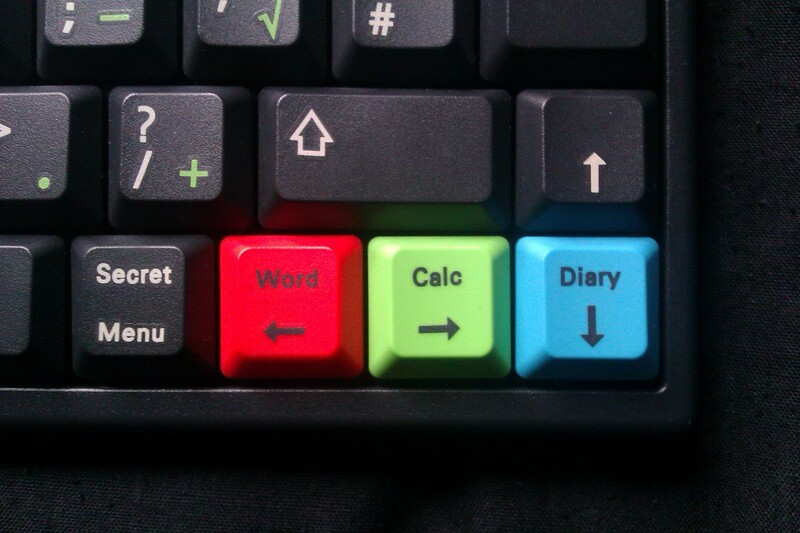 You navigate the menu’s using the colour coded functions keys, which makes getting around the screen pretty straight forward. I was in to writing my first blog in seconds of turning the computer on. Its interesting to note that the first section of the NC100’s manual, was apparently written by Sir Alan Sugar himself. Whether or not the chairman of Amstrad sat down and typed it all out on an NC100. is up to you to decide. I bought the NC100 with a mind to writing my blog entries while on the move. Its rugged construction and light weight seemed perfect suited. Unlike my HP netbook or my Archos tablet. The latter being a pain for typing anything more exerting then in a search engine. I can’t type on a touch screen, well at least not very well. Boasting 60 hrs battery life on 4xAA batteries. It puts my Netbook and Archos tablet to shame. However your mileage may vary. I discovered my fresh rechargeable batteries gave out on me after 2 hours of typing. So it might mean buying ordinary alkaline batteries. Alternatively if your at home, you can hook the NC100 up to it’s own power supply. This avoids the whole battery issue all together. So long as you have a power socket in close proximity to where you have chosen to work. Which proved a problem for me. So i resolved to battery power only. Even in light of this, it doesn’t require a great stretch of the imagination to believe the NC100 capable of impressive operating times. Which leads me to wonder how many people using modern tech, might benefit from a robust computer like the NC100. If all you want is something to type out work on. Then really there is no comparison. It makes me realize why there are still user groups for the Tandy TRS80-100’s. Weighing 1.096kg next to the HP Mini at 1.144kg’s. The NC100 is essentially the granddaddy of the modern netbook. It is worth noting the weight comparison. 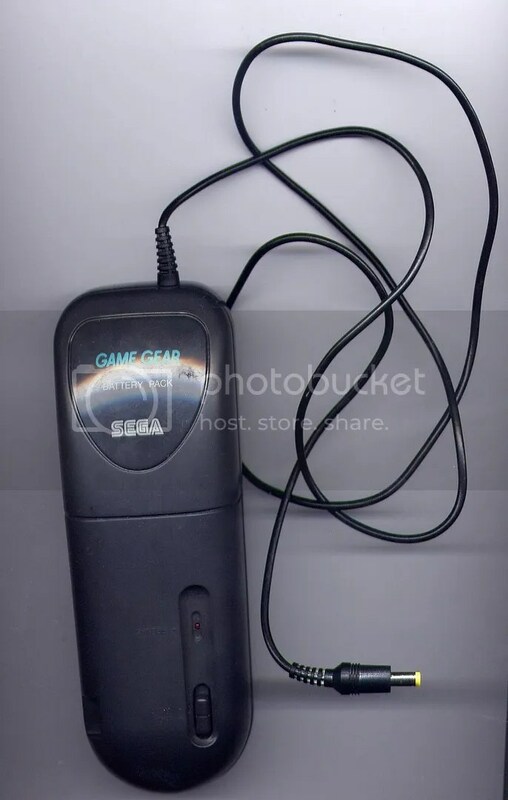 Even tho this blog essentially deals with retro hardware. It’s certainly impressive to see how modern tech compares to is predecessors. Hard to image that 1.144kg’s, comprises of a TFT display, hard drive, USB ports, plastics, keyboard and motherboard. Unless your sole reason for owning a NC100 is to write and print your work out. You’ll be wanting to get your files over to your main PC. This does require a bit of work with Hyper terminal and a null modem cable. However i was able to figure out and get a test file transferred from my NC100 to a Winxp computer in roughly 30 minutes by following the instructions i found online. The only real issue i had was hyper terminal. I found using another free ware app instantly gave better results. In this throw away, IPAD society we live in today. 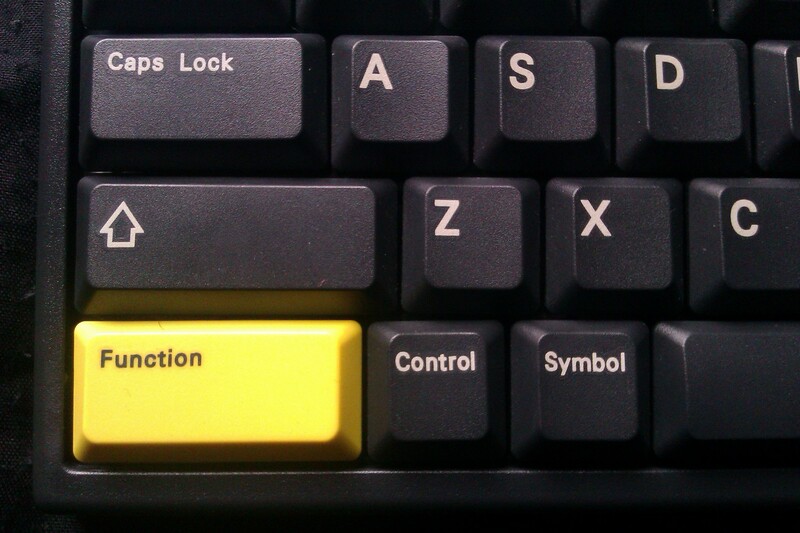 The general consumer seems put off by anything that requires more then clicking a few buttons. So hooking up a null modem cable and using hyper terminal might only appeal those who don’t mind getting stuck in. Half of the reward is in making the effort in the first place. The best part about transferring files is aside from purchasing a null modem cable. If you have a Linux or Windows computer, you already own the software. Under Windows Vista or 7, you will have to download software. However it’s still free ware, so doesn’t cost a penny. Tho probably worth emailing the author and thanking them for their hard work. If you follow the guide i found, you will end up with a text files on your desktop. Which you can load in to any word processor or simply cut and paste in to your blog and get it uploaded. Which is exactly the process I’m using for ByteMyVDU. As an avid recycler of old tech, I always try to find modern uses for old computers. Sometimes my endeavours end in failure and on rare occasions, success. I think the NC100 still has something to offer as a portable computer, if nothing more then for its word processing abilities alone. Here at ByteMyVDU, there’s no doubt the NC100 will be getting much use for up coming blogs. Keep on geeking guys and thanks for reading! So about a month ago I was toying about with the Beebem on the Nomad. A great emulator and well worth installing if your running Linux and happen to have a soft spot for retro gaming. However as is often the case with me, my thoughts drifted to the acquisition of a real BBC Micro, specifically a model B. Mainly because it was the model B, which I remember using at school and for some reason I always made sure I was sitting with this particular series. I honestly have no idea where this affinity with the “B” comes from. Generous people on the internet, no way! onse what so ever. I concluded it had been a good idea, but people where holding tightly on to their micro’s and I really did not have the funds to buy one from Ebay. If you consider a monitor, floppy drive, Model B bought all together or separate, the postage alone is worth crying over. Then the unexpected happened, I hadn’t been on Amibay for several days and was surprised to find I had an email waiting for me when I logged in at the beginning of this week. A very polite message asking me if I was still looking for a BBC Micro and if I was, I could have one, with monitor, floppy. All for the price of postage and a couple of beers. Yes you did read that right, I’m not pulling your leg. There still exists generous people on the T’interweb! As one might imagine, I took my time typing out a reply at around 30 letters a seconds! No sooner had I sent my reply. I received a response, saying the Beeb was still available and mine pending funds to cover the postage and consumption of fermented vegetable products. So without further ado, money was sent as soon as I had it to send. Now all I have to do is wait until next week, when hopefully the courier will be gracing me with a new addition to the vintage collection. How long till me Beeb arrives!? Finally have the last ingredients for making the retrobrite formula, originally I had intended to test the process out on a defunct A1200, but now my candidate shall be an aging Gameboy. Which sadly has succumbed to the effects of yellowing plastics. Watch this space for news on how I get on.